It’s official. Christmas is coming. Halloween and bonfire night are a distant memory and I’m a Celebrity is back on the telly.…sans Ant. The big news this season is Dec and Holly or is it Holly and Dec? I have no idea what the protocol is when double acts (temporarily) split up. Holly has been waiting in the wings for this for at least 12 months. Remember last year’s opening when it was joked that Holly was on standby? So how did she fare? Well, the first thing to say is that she looks 10 years younger than she did the last time I saw her on telly. I’m not sure if it is the Australian climate, a great skin regime or being away from her three kids for a few weeks; but she looked amazing. So did Dec. Seriously. That man was glowing (in a good way. Not in a nuclear incident kind of way). “Mid 20’s Holly” was dressed in very short shorts, which I’m guessing she bought at Very.com and they are probably tending today (if shorts can trend). Dec wore the same blue jacket that he wears every year (which I like, and I would like to see trending. I think the “Chairman Mao Cultural Revolution” look is set to make a comeback). 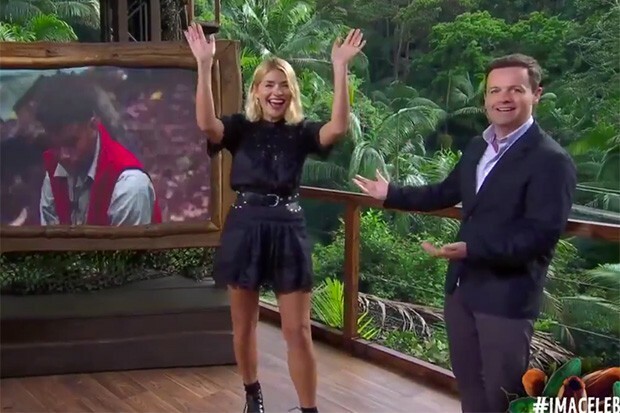 It was only when Ant and…sorry, Holly and Dec (this is going to take a while to get used to) headed into the jungle, that I noticed a problem with Holly’s outfit. She needed sensible shoes. Admittedly she had gone for boots, not heels, but she really looked a bit too glam when she was stood next to bedraggled, tired and emotional celebrities in their jungle garb. My recommendation to Holly would be to tone it down a smidge, but there again, what do I know. Florence and Fred are the most designer I get. There is obviously a change in the Aaaa….Holly and Dec dynamic. Currently Holly is playing the straight guy to Dec’s cheeky chappy. But give it a few nights once she has settled in and I think we will see the true Celebrity Juice Holly appear and normal “cheeky double act” service will be resumed (which may worry Ant and the Schofe somewhat). The two to watch in my opinion (and anyone who reads this blog regularly will know that I have an impeccable hit rate of never predicting these things correctly) are John Barrowman and Anne Heggarty. Barrowman is Marmite personified so within 24 hours we all be voting him into a snake pit or will be charmed by his theatrics. Could go either way (which is exactly what I said about Hardeep Singe Kholi on CBB earlier this year). Anne Hegarty is an interesting one. Already, a lot is being made of her Asperger’s and depending on how that manifests itself, she could do for that condition what Pete did for Tourette’s Syndrome all those years ago on Big Brother. But Nick Knowles will win it. As for the annoying one, at the moment Emily Atack is leading the field. Sorry, but she is just annoying. And the simple one? Has to be Harry “I thought there would be a bacon buttie van around the back” Rednapp. When they say, “I have never watched an episode of it”, I never believe them. In this case I genuinely think he hasn’t. All of the celebs will be desperately trying to avoid doing any “Roxanne Pargetter” career ending stunts. So that’s my night time viewing sorted for the next 3 weeks. After which I really should think about starting my Christmas shopping. I’m a Celebrity…Get me out of Here is on ITV each night for the next three weeks at 9:00 pm (times may vary) or on catch up on the ITV hub.